A KTWU producer captures the birth of Hope’s calf Elizabeth for Facebook Live Aug. 21. Elizabeth the giraffe has helped generate more than $10,000 and counting for Kansas’ KTWU and has brought the station thousands of fans worldwide. Not bad for a calf barely 4 months old. Little Elizabeth is one special star of six KTWU webcams at the Topeka Zoo that track the everyday adventures of giraffes and tigers. Since station engineers installed the first camera in April, over 5 million viewers have watched more than 110 million minutes of animal action. Even Elizabeth’s late-night birth, which streamed from 11:50 p.m. Aug. 20 to 2:30 a.m. the next day, garnered 85,000 video views. 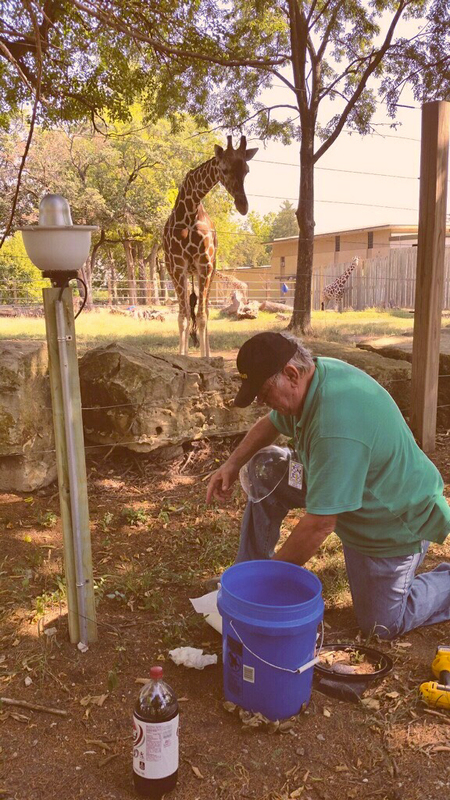 KTWU Chief Engineer Gary Krohe drills holes in webcam domes in July to prevent condensation as Abi the giraffe looks on. KTWU is on the map internationally as well. Viewers have tuned in from more than a dozen countries, including Germany, Japan, South Africa, Bangladesh and Russia. Few public broadcasters have trained webcams on animals. In 2003, Prairie Public Broadcasting placed a “falcon cam” atop a local bank building to webcast two peregrine falcons. Millions of people around the world saw two chicks hatch, and the station sponsored a naming contest. And Milwaukee PTV carried a live eagle nestcam on one of its multicast channels in 2002. Folks at Greater Public, a nonprofit that helps public broadcasters with development strategies, said they don’t know of anything else like KTWU’s project. “I think I’ve heard of a station feeding a gerbil or something every time they got a pledge,” said Andrew Leitch, marketing executive director. “I can’t speak to gerbils,” said Melanie Coulson, who directs member services and individual giving. But KTWU’s initiative “is certainly a unique partnership and I haven’t heard of anything like it before. I can see how the synergy between the value of PBS kids programming and the zoo is a great fit,” she said. 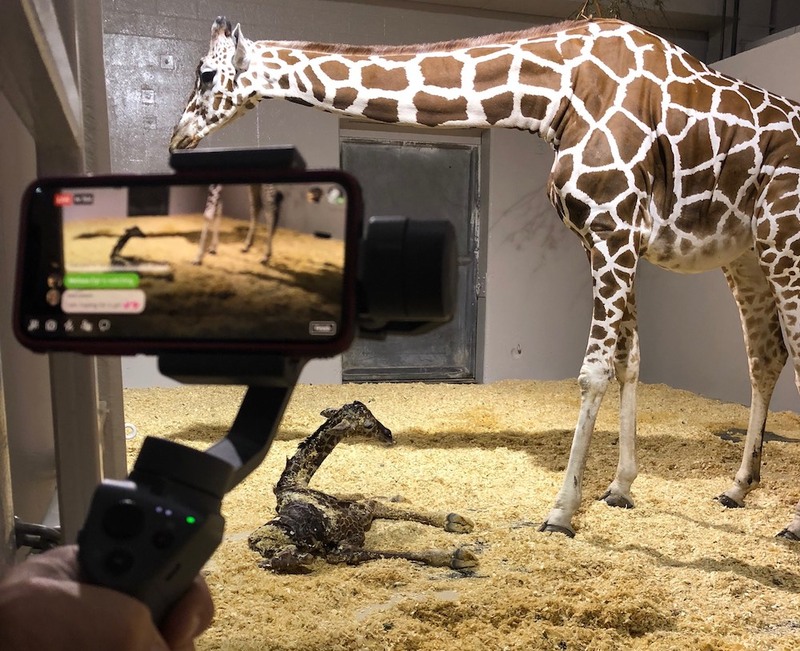 The idea for the project germinated last year, inspired by viral excitement over the impending delivery of April, a pregnant giraffe at an animal park in Harpursville, N.Y. Archived footage of the birth has garnered some 15 million views. When the birth was trending on social media, VanDerSluis realized the Topeka Zoo had two pregnant giraffes. “So we said, ‘Let’s do our own thing,’” she said. The organizations had not previously collaborated, and zoo officials were open to it. The station first needed to overcome a poor wireless connection at the zoo. KTWU spent about $20,000 on cameras and infrastructure that can handle up to 60 streams. The next hurdle was convincing station and zoo executives that the webcams would catch on despite disappointing early numbers. The cams launched April 30 “with a whopping 13 viewers,” VanDerSluis said. Station staffers held off on national promotions until small technical issues could be fixed. “I told my boss, ‘Give it time.’ Even the zoo was doubting it would take off,” she said. After buying Facebook ads in early June, “we started to see a slow uptick,” she said. By later that month, “we started seeing lots of uptick,” averaging around 20,000 viewers a day. VanDerSluis believes the nationally targeted ads finally reached giraffe fans who shared the links among themselves. Viewers see the giraffes and tigers nurturing their young, snoozing and playing. They watch zookeepers feed and care for the animals. And, on days with little animal action, zookeepers sing and do silly little dances for their amusement. 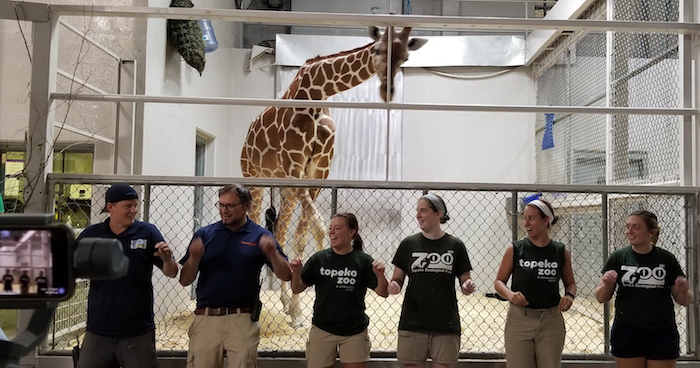 Zookeepers amuse webcam fans — and Abi the giraffe — with dances and other antics on the live YouTube and Facebook feeds. Fans are now so enthusiastic that an international group sent care packages to the station and zookeepers, as well as gifts for the animals. “They’ve even hosted lunches for all of the zoo staff and the KTWU staff to thank us for providing the cams,” VanDerSluis said. VanDerSluis estimates the station spends about $2,000 per month on staff time for the cams. Revenue for the station and the zoo, which split the proceeds 80-20, continues to grow slowly. Money comes in mainly from YouTube, based on how many users watch ads on the streams. Viewers on YouTube and Facebook also see donation buttons. KTWU hasn’t secured sponsorships for the giraffe webcams, but their success generated interest from potential sponsors for the tiger cams, which debuted in October prior to the birth of two cubs. The station also mentions the webcams in fundraising appeals, and producers hope to create a package for March pledge highlighting the giraffe and tiger births. Getting to this point hasn’t been without challenges. The station had to send cease-and-desist letters to local commercial TV stations that were using the live streams without crediting KTWU. The station must also monitor online comments coming from viewers who span the world’s time zones, which complicates the job. It has recruited a few trustworthy online fans to help out. “If trolls come on and post random, weird, nasty things, we take those off,” VanDerSluis said. The contract for the giraffe cam expires in January. “We may extend, or just leave two cams there and move two to another area of the zoo,” VanDerSluis said. The contract for the indoor tiger cam contract is up in April, and the contract for the outdoor cam ends in July. Both contain an option to extend. VanDerSluis discussed the project during the Public Television Programming Association’s session at the American Public Television Fall Marketplace this month in Baltimore. The idea has already inspired interest within the system. After Jim Macdonald, marketing director at PBS39 in Bethlehem, Pa., heard about it, he contacted the Lehigh Valley Zoo in nearby Schnecksville about potential webcams for giraffes, penguins and otters. The two organizations are now in “very early stages of discussing possibilities,” Macdonald said. “It seems like it would be a great opportunity to not only help give the zoo exposure during a slow time of year, but also could be great for fundraising,” Macdonald said. Kansas Gov. Sam Brownback (R) has proposed reducing state funding for public broadcasting by $100,000 for fiscal year 2016, a 16 percent cut from this fiscal year. Brownback’s proposed budget calls for a two-part reduction in funding that would cut state support by $12,000 this fiscal year, to $600,000, and then to $500,000 for fiscal years 2016 and 2017.